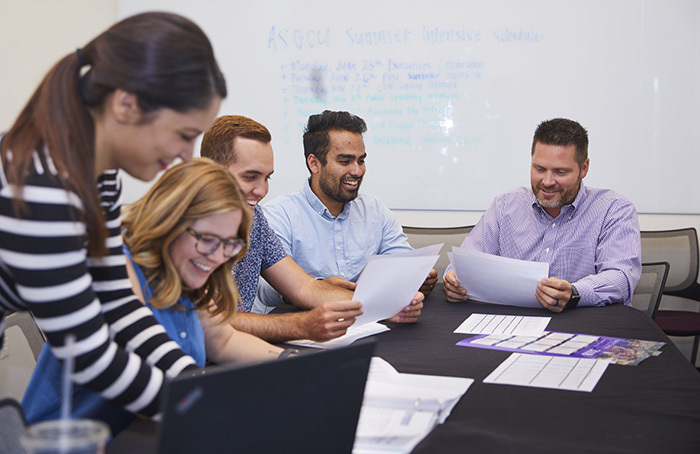 From left, Brittney Calton, Kaitlin Runion, Cody Dumas, Pablo Ciscomani and Jeremy Mack, Director of Student Engagement, discuss plans for the upcoming school year all designed to welcome and engage GCU students. The classic summer lyric by Seals and Crofts evokes a laid-back aura, yet the atmosphere in Grand Canyon University’s Student Engagement offices on a late June day kindle a decidedly different feeling. With hundreds of events to plan for the 2018-19 school year, it is not the time for the Student Engagement staff to relax. Jeremy Mack, Director of Student Engagement, oversees 13 staffers who lead Associated Students of GCU (ASGCU), Canyon Activities Board (CAB), Clubs and Organizations, Commuters, Diversity Office, ROTC, Veteran’s Center and Thunderground. Each Student Engagement staff member oversees dozens of student leaders. In the 2017-18 academic year, 583 activities fell under the umbrella of Student Engagement, not including hundreds of events planned and executed by the 126 clubs on campus. Although the number of events is staggering, it is not critical, according to Mack. Brittney Calton, Associated Students program coordinator, oversees three teams within ASGCU: Freshmen Class Council, Diversity Council and Volunteer GCU. 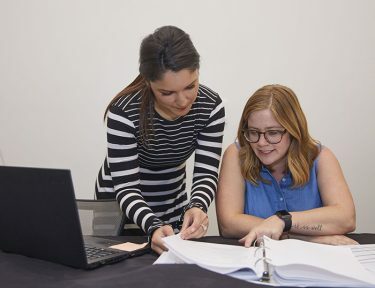 Her work with students over the summer began on June 25, when the four ASGCU executives arrived on campus to begin their preparations, including helping plan approximately 50 events during Welcome Week. The week involves more than 1,000 student volunteers, including approximately 50 in ASGCU leadership roles. While gaining leadership experience is often emphasized in preparation for college, Calton and other Student Engagement staff members do not require applicants to be experienced leaders. Four criterion are critical: being teachable, being available, being responsible and having a good attitude, according to Calton. Fitting the criterion is the 2018-19 student executive team: president Noah Wolfe, executive vice president Stephen Steininger, chief of staff Aly Halbakken and administrative vice president Tim McGill. They arrived on campus on June 25 to prepare for the fall semester. For 25 hours per week, in exchange for summer housing and a summer meal plan, the student executive team works with Mack; Calton; Pablo Ciscomani, clubs and commuter coordinator; Cody Dumas, student government coordinator; and Kaitlin Runion, clubs and organizations coordinator. The training, known as summer intensives, occur twice per week for two hours each. Planning events for Welcome Week is among the most time-sensitive matters. Ignite, for example, is one of the most spiritual events, as students gather in the darkness on the quad, light a candle, say a prayer and dedicate the new school year in a positive and profound way. Wolfe will make a speech and Pastor Tim Griffin, Dean of Students, will offer a blessing. “It is a very special event,’’ Calton said. Calton and Runion talk about upcoming activities at GCU. Ciscomani guides the clubs as they plan events and seek ways to add members. Among the most unique clubs is Medieval Combat Club, which grew from a group of students casually meeting to official club status in 2017. “It involves larping (Live Action Role Play), where a bunch of students get together and use rope swords, cardboard armor and engage in live action role play fights and battles,’’ Ciscomani said. Several clubs are applying for grants this summer for Welcome Week, including the Forensics Science Club, which plans a mock crime scene designed to teach students how to fingerprint, like CSI (Crime Scene Investigation). The computing club seeks funds to develop a new chip, and the Modern Board Gamers Guild is using funds to buy numerous board games for a board game night. The Hip Hop Club and Lindy Lopes are planning events while eSports strategizes to attract even more club members at the Fall Club Fair on Aug. 27. As campus enrollment continues to grow, Ciscomani strives to meet new needs. “With more students, there are more passions, which leads to creating a club we do not have or joining a club we already have and making that bigger,’’ he said. Club collaboration is also part of summer planning as the Black Student Union, Latino Student Union, Hui Aloha and Filipino-American Student Association are working together to organize a celebration during Welcome Week. The bottom line is engaging students, and if it requires summer sweat instead of summer chill, then Seals and Crofts will have to wait.